Since Google released the September security updates for Android devices last week, OEMs and Carriers are on the move. 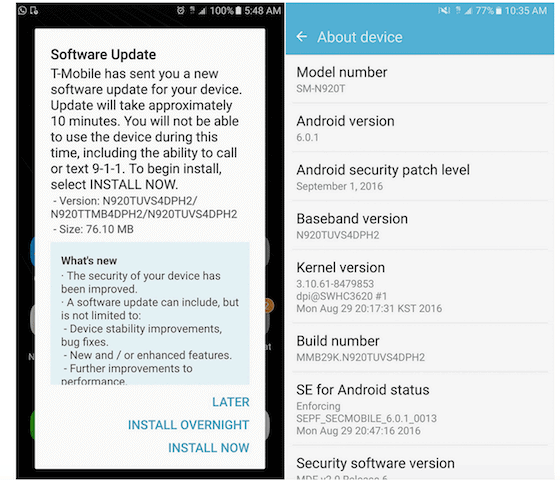 In order to bring the September security patch for Galaxy Note 5, T-Mobile Network is rolling out a small update. Whether T-Mobile has added fixes and optimizations over the September security patch for Galaxy Note 5 is unclear. With the latest software version N920TUVS4DPH2, all that the changelog of the OTA describes is a security update. The third-largest network operator in the United States is rolling out the 76MB update for its Galaxy Note 5 users across the country. These security updates should roll out across the United States within the week, so make sure you look out for it. To manually check for the update, go to Settings->About phone->Software update->Check for updates. You will only receive a notification about the OTA update if your device is charged more than 50%. Make sure that your Note 5 is fully charged before installing the update. A small file size and no explicit details in the changelog suggest that the September security patch for Galaxy Note 5 is the only upgrade that comes with the OTA. Have you already received the latest security update from T-Mobile for your Note 4? Is there any substantial, or even minuscule optimization that you noticed after the update? Keep us posted in the comments section below.